Join our mailing list and get 15% off the first three months of your LeilaBox subscription! Stay on top of special perks and events, too! Have you been thinking about buying or ordering jewelry online? Are you asking ‘what’s the difference between a cuff and a bangle’? Jewelry terms can be confusing and unless you’re a fashion jewelry maven you may not know exactly what you’re getting. 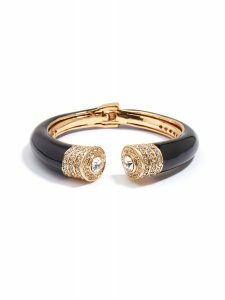 At LeilaBox we might send you all types of bracelets – so let’s figure out what could be coming your way, and talk about the basics of fashion jewelry styles. 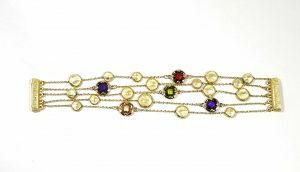 In this post we’ll talk about bracelets – a staple of your jewelry wardrobe that almost everyone can wear. 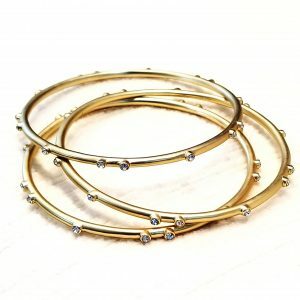 Bangle — A bangle is round and typically not flexible, but this can change with modern fashion jewelry. 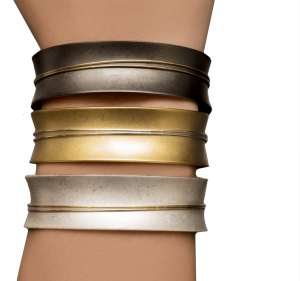 Bangles are versatile and can be worn lots of ways – stack them, wear them alone, with a watch, or with other types of bracelets. Mix and match your bangles in style, color, texture and size and you can customize the look to be as unique as you are! Beaded — Beaded bracelets can range from delicate stones or crystals to pearls, resin or lucite beads and everything in between. It might be threaded on elastic or thread and have a lobster clasp, but these days they come other ways as well. Beaded bracelets are a great way to add a pop of color and texture to classic gold or silver arm candy. Mixing the Beaded and Wrap bracelet is a great way to get a stacked look, as if you were wearing a bunch of bangles. Cuff — Like the bangle, the Cuff is round but it’s open on the wrist. This Cleopatra-inspired style is a fitted bracelet, and is usually adjustable so it fits all types of wrists. The width can be as varied as the women wearing them. Traditionally a cuff is worn alone; but you can try making a fashion statement by mixing a cuff and a few bangles. Link — From simple, elegant links to elaborate hand crafted chains, the Link bracelet is links or a chain to create a bracelet. Links can be mixed, intertwined with other materials or have multiple strands. The basic Link bracelet is a metal chain, but these days it could be made of anything from resin to leather. Wrap — Wrap bracelets come in many shapes, styles and lengths with one thing in common: they wrap around the wrist. From wired beads to a long leather embellished wrap, the Wrap bracelet can make it look like you’re wearing stacked bangles with just one piece. 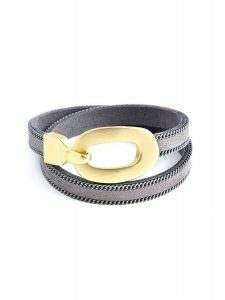 Bracelet styles are uniquely different from each other, but you should feel free to mix and match to show off your own sense of style. Don’t limit yourself with materials, colors, or elements — bracelet combinations are only limited by your imagination! Not all bracelets fit every woman the same. You’ll find some like the fit of the cuff, snug at the wrist; others like the movement of a loose bangle; and still others like a simple, delicate chain, maybe with a gemstone or bead for color. A subscription to LeilaBox is the perfect way to try out every style and figure out what you like best – or wear all of them, whenever you want! Join today! Coming soon – Jewelry 101: Necklaces! 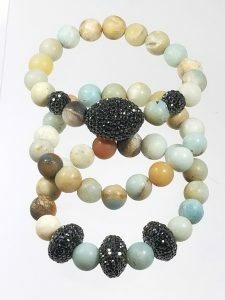 Preview our jewelry and buy it directly at www.leilajewels.com. LeilaBox subscribers get special discounts!